The Gran Chaco is a vast and varied landscape spanning Brazil, Bolivia, Paraguay, and Argentina, under threat by logging, agriculture, and over development. These double gatefold illustrations appear in the Summer 2018 issue of World Wildlife Magazine. Illustrated comic graphic on the origins of life on Earth. Published in the June 2018 issue of Scientific American. Various spot illustration portraits done for National Geographic Traveler. Poster for the National Parks Service Alaska Archaeology Month 2018, highlighting the Ocean Bay, an ancient people of the arctic. Comic story for World Wildlife Magazine about a conflict tiger in the Russian Far East, Uporny. It was captured, rehabilitated, and released into the wild. Researchers monitored it movements, gaining incredible insights into the life and death of an elusive species. Illustration for a graphic showing the shredding of a star by the gravity of super massive black hole. Published in the April 2017 issue of Scientific American. Poster for the National Parks Service Alaska Archaeology Month 2017, highlighting the Paleoarctic, an ancient people of the arctic. Illustrated graphic showing how antibiotic resistance spreads in bacterial populations. Published in the December issue of Scientific American. Spot illustrations accompanying the review of J.K. Rowling's Fantastic Beasts in Entertainment Weekly. Published in the November 25 issue. Print series highlighting great species of the North American continent, focusing on the conservation status of each. The American Grizzly, the Bison, and the California Condor. It may not come as a surprise, but worms in your garden will actually help your soil. In a process called vermicomposting, organic matter is ingested, broken down in the worms digestive track, and excreted as matter teeming with bacteria and nutrients that help plants grow. This illustration was done for an NPR on vermicomposting, published on NPR.org in August 2016. Mangroves play a crucial role in nearly two-thirds of tropical coastal ecosystems. They provide habitat for many land and sea species, protect shorelines from erosion, and act as a natural carbon sink. This illustration appears in the Winter 2016 issue of World Wildlife Magazine. Destruction and theft of cultural antiquities are often linked to conflict. Since the outbreak of the civil war in Syria, looting has risen to devastating levels, with ISIS as one of the biggest perpetrators. This illustrated spread was published in the June 2016 issue of National Geographic. Prints for sale on Etsy and Society 6. Illustrated graphic depicting how the Yellowstone ecosystem recovers from severe wildfire events. Graphic appeared in the May 2016 issue of National Geographic. Poster for the National Parks Service Alaska Archaeology Month 2016, highlighting the Thule, an ancient people of the arctic. Illustrated graphic about the discovery of a particular plant species growing atop kimberlite pipes, the geologic formations that bring diamonds to the Earth's surface. Published in the February 2016 issue of National Geographic Magazine. Poster for the National Parks Service's Alaska Archaeology Month, highlighting Alaska's ancient people, the Northern Archaic. 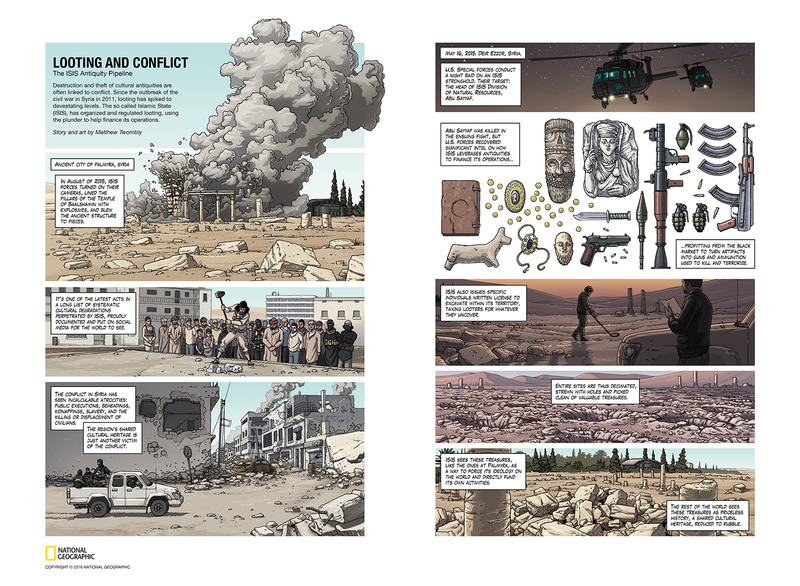 Comic spread, The Case of the Fearless Rat, for November 2014 issue of National Geographic. Awarded Bronze at Malofiej 23. Poster for the National Parks Service Alaska Archaeology Month, highlighting the Denbigh, the ancient people of the arctic. Original comic about a hunted man in the west. Written and illustrated by yours truly. Original comic about the last days of a mountain man. Written and illustrated by yours truly. Cover concept for a comic pitch called, Blood Brother. Illustrated portraits for an information graphic in the May 2012 issue of National Geographic. Layout and graphic by Lawson Parker. Motion graphic about the rise of the Food Truck industry appearing in the July 2015 issue of National Geographic. Character sketches for the comic, Grim Hunt. Illustrations for an infographic in National Geographic digital edition. Vector illustrations explaining different methods of farming fish. Spot illustration for a story on submitting names for distant exoplanets. Published in National Geographic Magazine. Character sketches for a comic project called, Blood Brother.